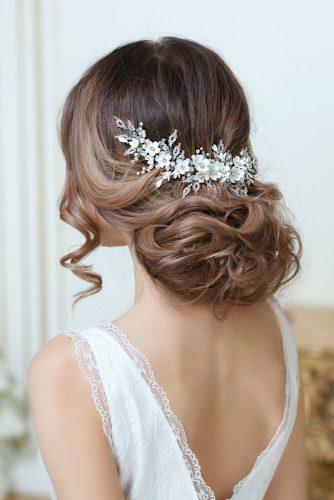 Every bride wants to look perfect on her wedding day, but no look can be complete without a beautiful hairstyle. 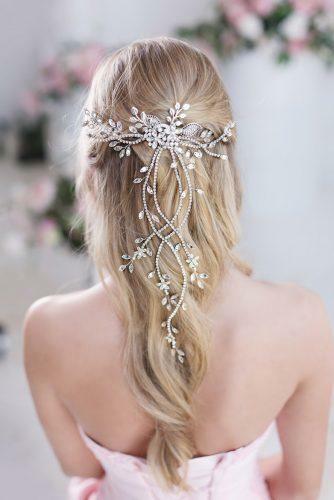 If you are looking for something truly special on your wedding day, Top Gracia hair accessories are exactly what you need! 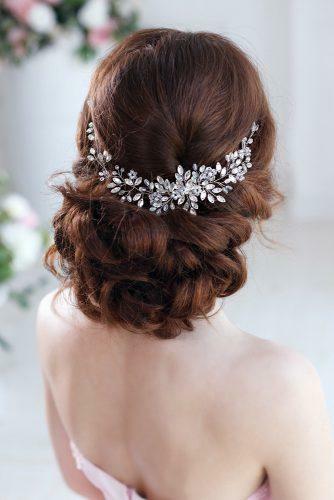 This brand offers astonishing bridal hair accessories and jewelry. Everything you need to nail that perfect look: hair combs, headpieces, bridal crowns, hair vines, wedding hair pins, and much more! TopGracia is renowned for its stylish bridal and bridesmaid jewelry. Meticulously handcrafted, these exclusive designer accessories are the very image of elegance and style. Each step of the design process is carefully handcrafted with attention to detail and style. The designers reproduce several versions of the item from the initial design on paper, to guarantee superior beauty and quality. What can be more romantic than rose gold? 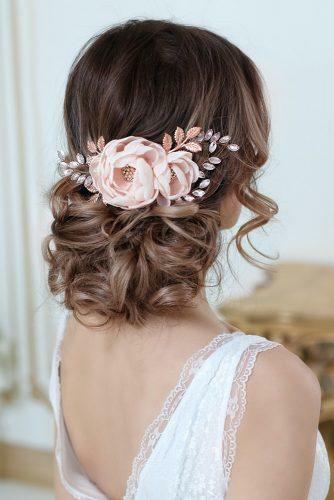 Top Garcia is happy to offer a variety of hair accessories in the delicate blush color. 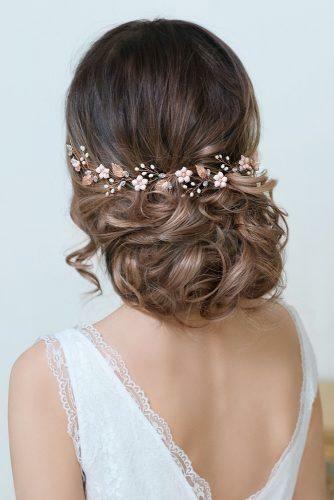 Diona – a tender rose gold bridal peony hair flower with beads and rhinestones. 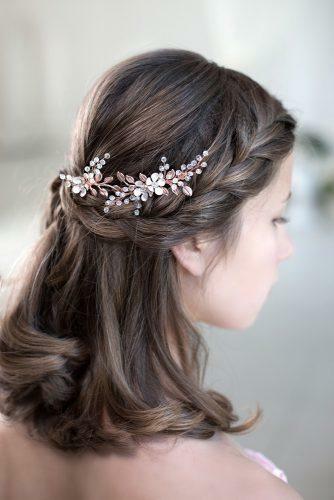 Kassandra – a set of graceful hairpins, representing intertwined rose gold branches with leaves. Kore – a crown flower headband weaved with rose gold jewelry wire. 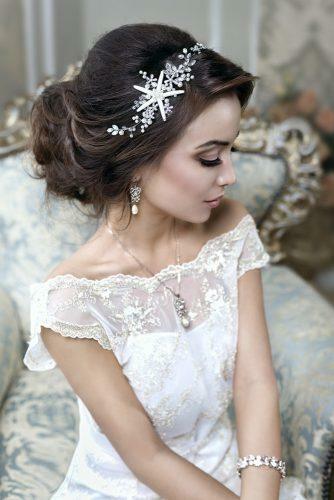 Complete your stunning wedding look with elegant bridal headpieces! 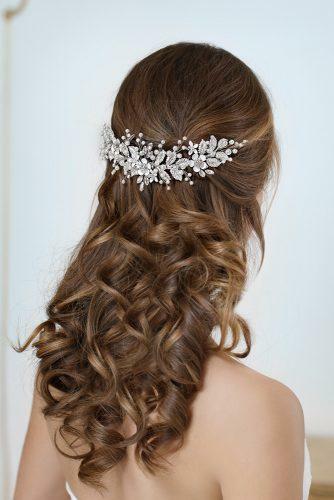 Gorgeous Nikerphoros with crystal leaves and flowers will be the perfect choice for your voluminous hairstyle. Feminine Chrysanthe with three charming white faux pearl flowers will add extravagance to classic-looking romantic brides. Vintage-looking Olympia with ivory blooms and crystals will perfectly fit your boho look. 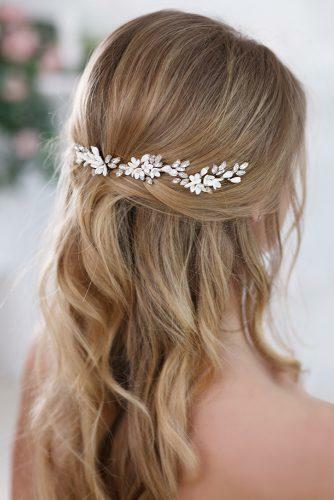 Flower motifs are on the rise this year, so don’t hesitate to add a little extra to your hairdo! 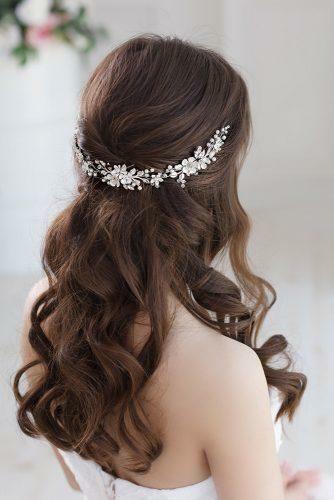 Long hairstyles will go gloriously with flower wedding hair vines! 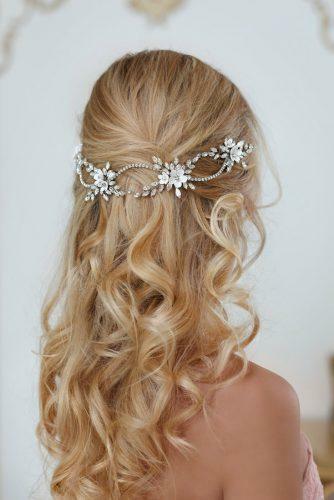 Delicately sparkling Leda hair wine will accentuate long luxury locks with crystals. Look divine, draping marvelous Dianthe loosely so that the glowing crystals drop down in a breathtaking wave. Create an angelic image with Dora’s flowers, pearls, and crystals. What can be more romantic, than flowers and crystals? 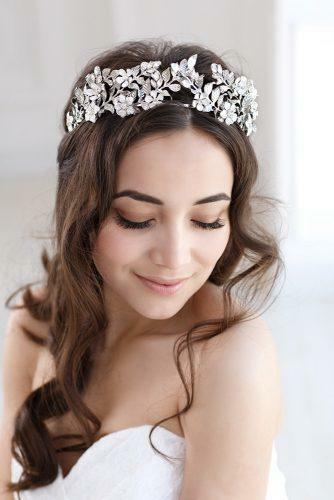 Astonish everyone with your sparkling image with crystal bridal headpieces! Andromeda is all about gleaming crystals, elegantly collected in an intricate lace-like pattern. Kleopatra’s long silver branches twine gently to form a halo adorned with handmade white flowers and plenty of shining quartz. 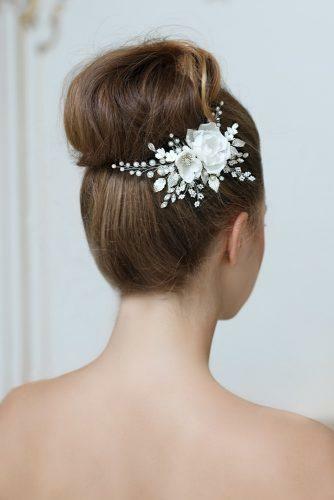 Hand-crafted Rose bloom hair comb with white rhinestones is what you need for an outstanding bridal appearance! 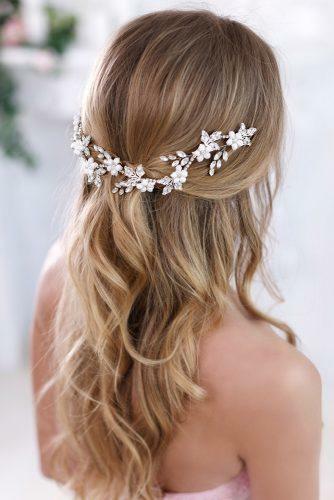 White flowers headpiece can compliment almost any bridal look. Little crystals and pearls of Dorcia will make a small heritage to pass from mother to daughter! Kalypso hair pins will add a shade of romantics to your look to make you imagine yourself a real Juliet! Amazing Demetra looks tender and delicate, yet is impressively durable to withstand the whole ceremony and the celebration without letting you down! The Meghan Effect in action – bridal fashion trends is as majestic, as ever. 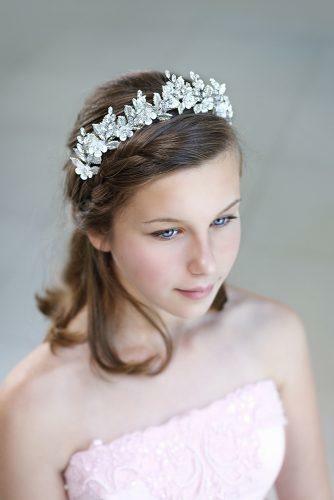 Do a real wedding tiara to get that royal look on your special day! Try the cluster of shining crystals of Eunike. Look like a marvelous mermaid in a beach wedding with Despoina. Show off your opulence with Amara – its dazzling crystals make pretty little flowers. 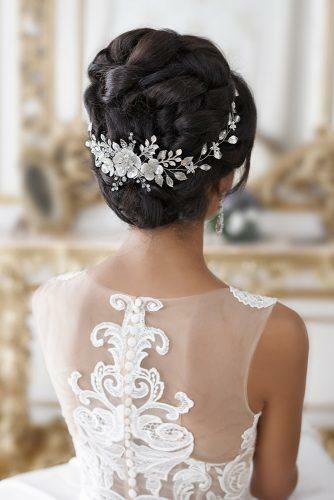 Any Top Gracia headpiece is magic!